Something that drives me crazy is seeing people striving towards some big goal, wanting it with every fibre of their body, but yet being unable to achieve it. And one of the big reasons for this is email. That’s right, too many of us let our emails dictate how we spend our days – and this stops us from doing the things we want to do. So if email is ruling your life, now’s the time to do something about it! Years ago, I lived out of my Email Inbox too. I opened it upon waking and went back and forwards all day – my “priorities” changing with the latest “ding”. Now, I view email as just another messaging platform. I receive messages on email, Slack, WhatsApp, Facebook, SMS, Skype and numerous other services – but they are all just messages. When you use email as your to-do list, you’re constantly relying on and allowing others to determine your priorities. Not sure if you do this? Have a look in your inbox. How many emails do you refuse to delete because you haven’t yet actioned them? That’s your to-do list! Having clear priorities and taking action towards your priorities is what makes successful people successful. So instead, of letting your emails decide what you do, choose a good productivity tool that allows you to have a master task list and a daily action list. Of course you need to action some of the emails you receive, but this is about letting your email system decide how to prioritize that action. So next time, when you receive an email that needs actioning, either respond straight away, or add something to your action list. These days, all of the decent email platforms have great automated filters. The problem is that people don’t use them enough. The trick here is to use automated filters to separate emails that need attention from those that don’t. I previously created these manually myself, but now Gmail does a great job of this (with a bit of extra training!). I recommend using a “To read” label and everything that is promotional, news articles, or things that don’t require any urgent attention go here. When I have the time and inclination, I browse through this folder and read only those emails that grab my attention. I must admit that I still look at email first thing in the morning, but for the most part I leave the responses until later. It’s very rare that an email received overnight will change my top priorities for the day. Once I’ve done a few of the things on my agenda (not someone else’s! ), I’ll then spend 30 minutes dealing with email. Have you ever noticed how many emails are needed to make simple arrangements with friends or colleagues? Save the back and forth with days, times and places and use a scheduling tool for making arrangements with other people. Something like Calendly can link to your calendar and let other people choose a time that suits you. Have you seen that Gmail has a great new “Snooze” button? It allows you to have an email returned to inbox at a later date that you decide. This is ideal for situations when you can’t take action on something until something else happens (for example, if you’re waiting on someone to respond to something). It helps you clean up your inbox and not be distracted by things that don’t matter at the moment. If you don’t use Gmail, this function is also available in applications like Inbox by Google or with add-ons like Boomerang. Inbox Zero is difficult to achieve and it’s also quite frustrating – as soon as you get there, you’ll receive another email! Instead, aim to finish each day with less than 20 emails in your inbox – for me, this is the number I can see on my screen. We’ve all done it – sent an email to the wrong person, forgotten to cc someone important on an email, or written something completely stupid. Instead of doing this, adopt the simple practise of leaving the recipient’s email until last. Only enter their email address once you have re-read your email! 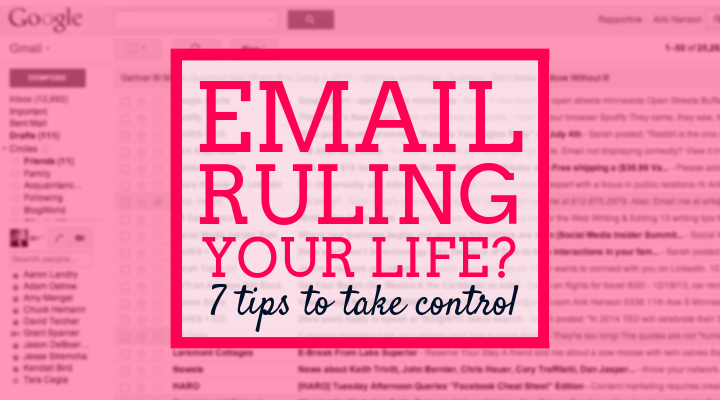 So there you have it – 7 tips, plus a bonus, to stop email ruling your life. Imagine your day without the stress of an overflowing inbox and the constant frustration of never getting on top of it. Imagine thinking of email as simply a tool that you sometimes use to communicate. So, the question is… how many of these email management tips will you put into action?